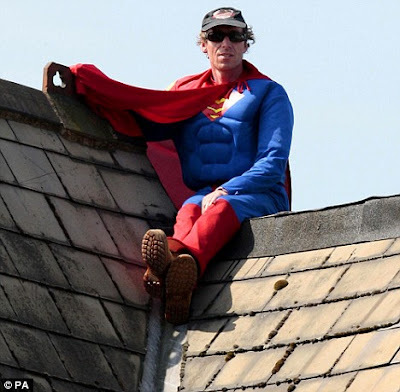 A Fathers 4 Justice protester today vowed to remain on top of Harriet Harman's roof until his fellow protester had been released by police. He also accused officers of using 'heavy-handed' tactics in trying to wrestle him down. Jolly Stanesby and fellow demonstrator Mark Harris scaled the deputy leader of the Labour Party's house yesterday morning dressed as 'Captain Conception' and 'Cash Gordon'. Mr Harris climbed down and was arrested last night but his fellow protester spent the night sleeping under a tarpaulin and insisted today he was staying put. The pair were taking part in their latest protest over the treatment of fathers in child custody battles in court and had unfurled a banner reading 'A father is for life, not just conception'. The activists demanded the MP for Camberwell and Peckham read Mr Harris's book, Family Court Hell, an account of his court battle for custody of his two daughters. Originally boasting they had enough food and water to stay aloft for a week, Mr Harris soon had to be brought down suffering from heatstroke. He was arrested and faces charges of criminal damage and causing a public nuisance. Fathers 4 Justice dismissed her claims that she had no record of a previous request for a meeting. 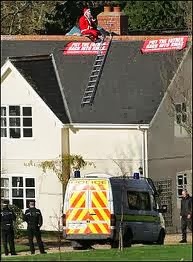 Miss Harman, 58, said it was not fair to waste police time or disturb her neighbours so she was going to stay elsewhere. Three police cars were parked outside the house this morning and officers have already started a security review to work out how the Fathers 4 Justice campaigners were able to scale the walls of Miss Harman's home so easily. The men claimed they had simply entered through an unlocked gate and propped a ladder up against the wall of the three-storey house. Miss Harman was targeted because, in her previous Whitehall job as Solicitor General, campaigners say she did not do enough to open up access to the family courts. It was also claimed that she had hinted at support for the aims of Fathers 4 Justice, but had done nothing. The drama started at about 8.15am. 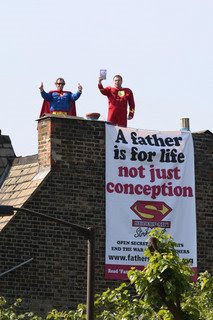 Once the two Fathers 4 Justice protesters were on the roof they unfurled a banner reading 'A Father is for life, not just conception'. 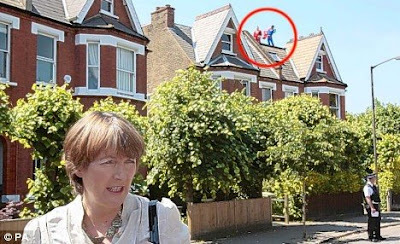 Mr Harris, speaking to the Daily Mail by mobile phone from the roof, insisted the stunt was a peaceful protest, but said it raised questions about Miss Harman's security arrangements. 'All we did was push open the gate, which wasn't even locked, put a ladder up and climbed up,' he said. A spokesman for the militant group - whose previous stunts including throwing flour at Tony Blair in the House of Commons and scaling Buckingham Palace - said the demonstration was intended as an 'early Father's Day strike' against the Government over fathers' access to their children. Ms Harman, the Minister for Women and Equality, stayed inside the house for more than six hours. But with no end to the stand-off in sight, she eventually emerged from the home she shares with Jack Dromey, treasurer of the Labour Party, to condemn the protest. The demonstrators demanded a meeting with the Cabinet Minister during their sit-in, claiming she had refused to see them. 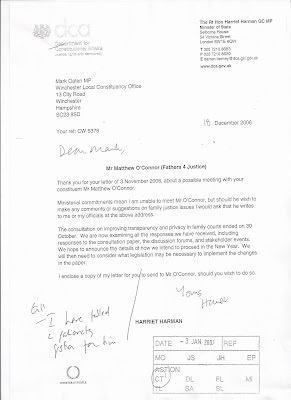 Fathers 4 Justice spokesman Darryl Westell challenged Miss Harman's claims. Fathers 4 Justice was shut down in January 2006 after extremist sympathisers were accused of plotting to kidnap Mr Blair's son Leo but was relaunched four months later when campaigners invaded the live broadcast of the National Lottery draw.